This ceremony was written and performed by me in Irvington-on-Hudson, N.Y. I offer a variety of services. 2. I perform: wedding ceremonies, bereavement and memorial services, coming-of-age ceremonies and baby namings. 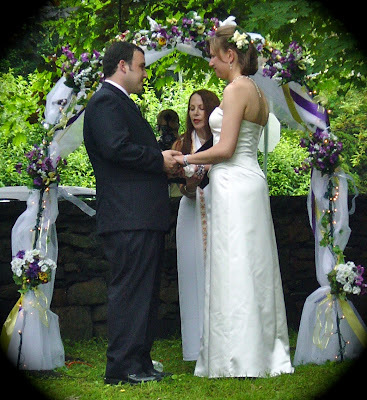 As an Interfaith minister I write ceremonies to suit your needs and personal beliefs. All faiths and spiritual choices are honored. 5. I sell Life Force International Products. I only recommend products that I personally use for my nutritional needs. I have found the following products to be extremely helpful. I take four ounces of Body Balance every morning. It has increased my energy and decreased my susceptibility to colds and viruses. Contact me if you are interested in buying any of the products or if you need any additional information. Build better health on a foundation of nutrition with Body Balance. Supporting each of your core body systems, Body Balance is a powerhouse of liquid nutrition, formulated with SeaNine™, our select blend of nine sea vegetables, and Aloe vera. Aloe vera alone contains over 75 nutrients and 200 active compounds, including 12 vitamins, 20 minerals, and 18 amino acids. Combined with SeaNine™, our proprietary blend of nine select varieties of nutrient-rich sea vegetables--Body Balance is absolutely loaded with unique whole food nutrition. SeaNine™ provides a broad spectrum of trace minerals and phytonutrients that are more frequently deficient from land-based diets. It's pleasant tasting, and its liquid form promotes easy absorption. Why sea vegetables? The mineral riches of the earth that have been washed into the oceans have been reclaimed by sea vegetation. Furthermore, the chemical balance of the human body is similar to that of seawater. The nine varieties of sea vegetables in Body Balance are sustainably harvested from pristine ocean waters around the globe. The Aloe vera in Body Balance is carefully harvested under low temperatures to protect the key polysaccharides, grown and processed according to organic standards, and is inner-fillet aloe. The pairing of SeaNine™ vegetables with Aloe is dynamic. Experience what it feels like to finally give your body the nutrients it craves for optimal performance. Body Balance is made with Stevia, a natural, zero-calorie sweetener that is more than 30 times sweeter than sugar. The Stevia plant is a perennial shrub native to Paraguay and Brazil and has been used as a sweetener by the Guarani Indians for hundreds of years. The body processes Stevia very slowly, which greatly reduces the risk of a sugar high. In addition, Stevia is calorie free, making it popular with dieters. Research suggests that Stevia may be a safe alternative for diabetics, although always consult your doctor before making additions to your diet which may alter blood sugar. Most people know that calcium builds strong bones. But calcium also plays a critical role in maintaining cardiovascular health and reducing the risk of osteoporosis in latter life. OsteoProCare is a high-potency, highly absorbable liquid calcium and mineral supplement containing glucosamine, chondroitin, and micro amounts of 46 trace and ultra-trace minerals, and delivering 1200 mg of calcium and 600 mg of magnesium per serving. It's also an excellent source of Vitamin D3, iron, zinc, selenium, chromium, manganese, and copper. So, in addition to supporting healthy bones and joints, the vitamins and minerals in OsteoProCare support immune function, help to maintain healthy blood sugar control and even act as antioxidants. You're never too old or too young to benefit from calcium. With pleasant-tasting vanilla-flavored OsteoProCare, it's easy to get the calcium and other minerals you need to keep you standing tall.